The Geneva-based manufacture’s emblematic Crazy Hours model with its jumbled up hour numerals is now joined by another unconventional time-reading instrument. When the first Franck Muller’s Crazy Hours was released more than 15 years ago, it caught attention for its unique expression of time where the hour numerals were not displayed in the conventional order. For instance, ‘12’ was not displayed at the top of the dial; instead, it traded places with ‘8’. Yet, the watch somehow still managed to tell the correct time thanks to a jumping hour hand that moved straight to the right numeral at the end of the hour. The minutes, however, were indicated in the traditional 60-minute cycle around the dial. This unique design has held its allure over the years. Housed in a tonneau-shaped case, the Crazy Hours is fun and outrageous, made even more captivating by design permutations that range from classic to fanciful. The latest release for men takes on a sporty allure with a forged carbon case that is strong, durable and incredibly lightweight. It is matched with a brushed matte black dial with bright yellow indexes. Yellow stitching also gives the black alligator leather strap a pop of colour. For the ladies, the new Vanguard Crazy Hours Lady features a case set with 133 diamonds and 40 rose sapphires, and a dial adorned entirely with 215 diamonds and 84 rose sapphires. The hour numerals mimic the colour of the sapphires. 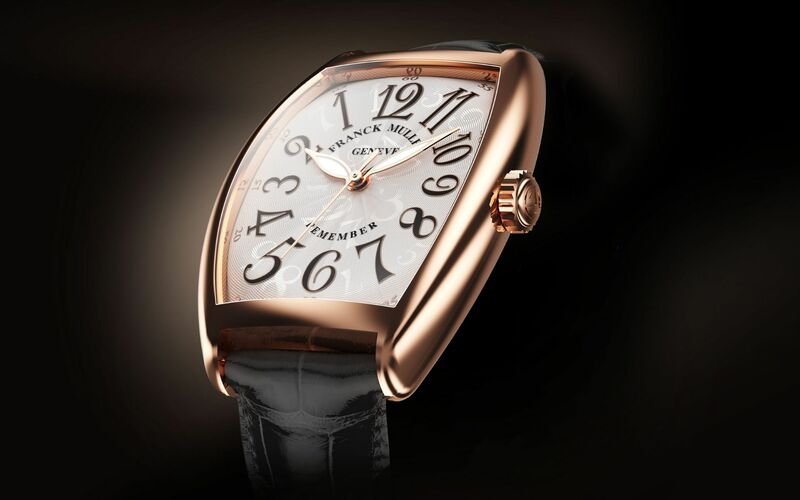 Unrestrained by norms, Franck Muller has gone and created yet another unusual time concept. Meet Remember, a watch where the hour, minute and seconds hands move anti-clockwise in order to tell the correct time. As such the hour numerals have also been flipped around. Designed for men and women, the new tonneau-shaped timepiece measures 31mm in width and 43mm in length, and comes with an 18k rose gold case with guilloche sun pattern dial finished with 20 layers of lacquer.